"Most if not all" of those shot in Ballymurphy "were not IRA", the former commanding officer of a key battalion in the Parachute Regiment has said. Gen Sir Geoffrey Howlett, 89, was giving evidence at the Ballymurphy Inquest. It is examining the deaths of 10 people in west Belfast in August 1971. Gen Howlett denied that his men in B Company had lost control and fired more than they should have. "I cannot say I knew it or saw it, and I would be surprised by it," he said. However, he said he has "enormous sympathy" for all relatives of those killed in the Ballymurphy shootings. Gen Howlett described the first day of interment in 1971 as "the busiest day of my life". He expressed his sympathy after asking the coroner if he could address the families of the bereaved. He addressed them whilst looking across the courtroom towards the jury area. Gen Howlett said he had lost his own father, killed in Italy during the war, when he himself was aged just 13, and therefore knew something of bereavement. He later rose to be commander-in-chief of Allied Forces in Northern Europe, retiring in 1989. 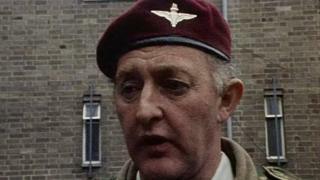 As Lt Col Howlett, he was commanding officer of the 2nd Battalion the Parachute Regiment, known as 2 Para. The regiment was based in the Ballymurphy area at the time of the shootings along with the 1st Battalion (1 Para). Gen Howlett was the officer who deployed B Company 2 Para to Vere Foster school and Henry Taggart Hall, both army bases on the Springfield Road. Gen Howlett recalled meeting Father Hugh Mullan some weeks before the priest was shot dead. He said he was sure that he had indeed been administering the last rites when he was shot. "It was quite obvious Father Mullan was not part of the IRA" he said . Fr Mullan was killed in the same incident as Francis Quinn, on waste ground near Springfield Park. The other four people fatally shot were in the Manse area opposite the Henry Taggart army base. Gen Howlett said he was based on the Springfield Road at the time of the shootings on 9th August 1971, but came to Henry Taggart Hall in the late evening to resupply B Company with ammunition. He described being ambushed on the journey. He said he believed that 30 to 40 rounds were fired at his land rovers when they entered the base. He claimed the firing at them was coming from the south west. He described hearing later of the death of Fr Mullan, and was surprised to read in recent years that the UVF now claim to have been operating in the area. "The UVF never took us on" Gen Howlett told the court. "In fact we rarely saw them". Several times during his evidence, he said that his memories of the time had become "muddled", but said he had better recollection of moments when he had been fired on. "I find my memory of places and timing very difficult" he said. He remembered that it was not common practice to conduct a forensic examination of soldiers' weapons after civilian deaths. He also said that no soldier was disciplined over the events of 9-11 August. He told the court that his brigade commander, Brig Kitson, had disagreed with the introduction of internment, and that no one had realised what it would lead to. He said the introduction of internment had totally changed Belfast and created a "full-blown battle". He added he and his military colleagues were unprepared for "such a rebellious period, with as much rioting, shooting, petrol and nail-bombing as there was". "I don't think any of us were prepared for the big change." A regimental history from 1971 was read out to Gen Howlett, stating that the Paras had inflicted severe damage on the IRA on 9 August. "I think that was our belief at the time" he said. He accepted that their beliefs and thoughts at the time were mistaken. He added that later "we realised that most if not all were not IRA". The retired general agreed Daniel Teggart and Noel Phillips were not "members of the IRA firing at us". "I accept that" he said. He added that he was not certain that the two men had not been associated with the IRA. Later Gen Howlett agreed his men knew they sometimes faced " an enemy without a uniform". But he said he had never heard of maltreatment and abuse of prisoners at Henry Taggart base until it was mentioned by a barrister for some of the families, and accepted that it was wrong. He was also asked if the Parachute Regiment had a bad reputation for dealing with the community compared to other British Army regiments. He stated that some regiments and other parachute battalions "weren't too keen to have 1 Para in an area to sort something out" because they had to continue to serve there afterwards. But he added there were times they were very glad to have 1 Para dealing with difficult situations. He was asked if he ever saw Paras behaving badly. "I saw them being rough, I never saw them doing anything disgraceful or illegal. I would have stopped it if I had." He denied his battalion contained "thugs, bullies and psychopaths", adding that he travelled around his battalion a great deal and never saw such behaviour. Challenged that he knew of and encouraged brutal behaviour, he replied: "Absolute rubbish. That goes against everything I've done in my life." In court he was read a transcript of a BBC interview with a paratrooper who said firing back in such situations had been "great". Of the comment, Gen Howlett said he was, "if not ashamed of it, disappointed in it." When it came to the firing at Henry Taggart base, he added that, "no doubt, in battles of this sort, people are going to get accidentally hit."